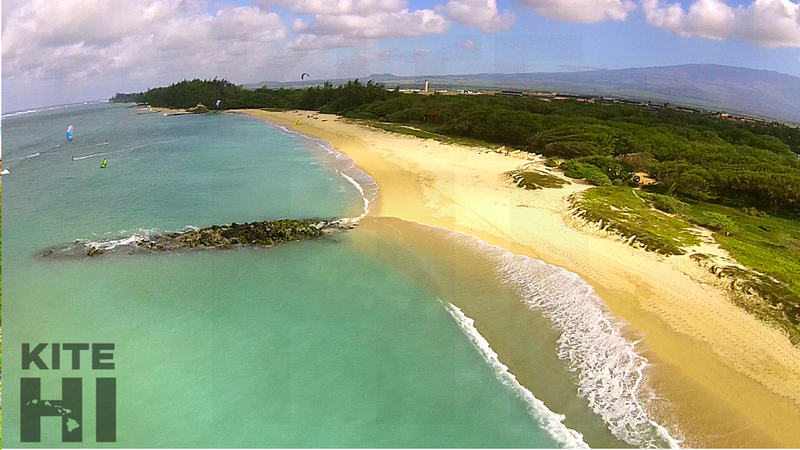 We are on a special permit from the FAA to be allowed to kite within 5 miles of the airport. 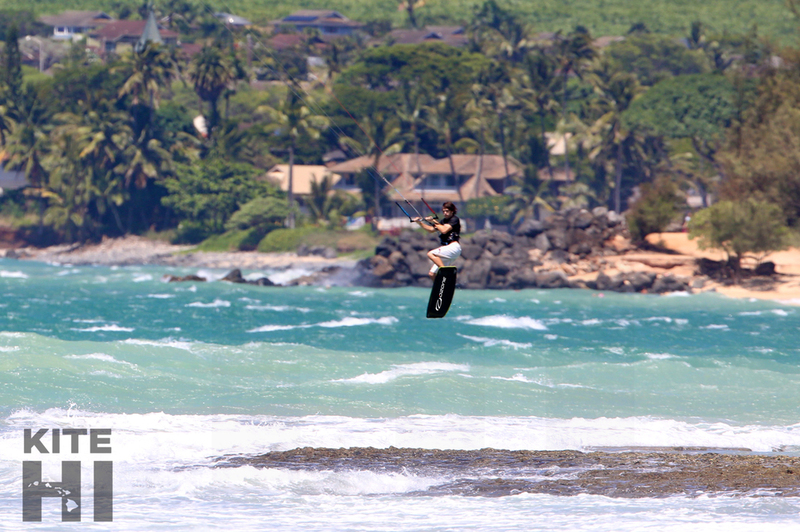 All kitesurfing participants must be responsible for seeing and avoiding all aircrafts. No kiteboarding in the 2 nautical mile long by one nautical mile wide corridor. The corridor’s length starts at the end of the OGG airport runway. The corridor’s width is comprised of one half a nautical mile on each side of the runway, from the runway’s end to sea. See Map below. This is where all the magic started in the late 1990s and continues to deliver good winds. 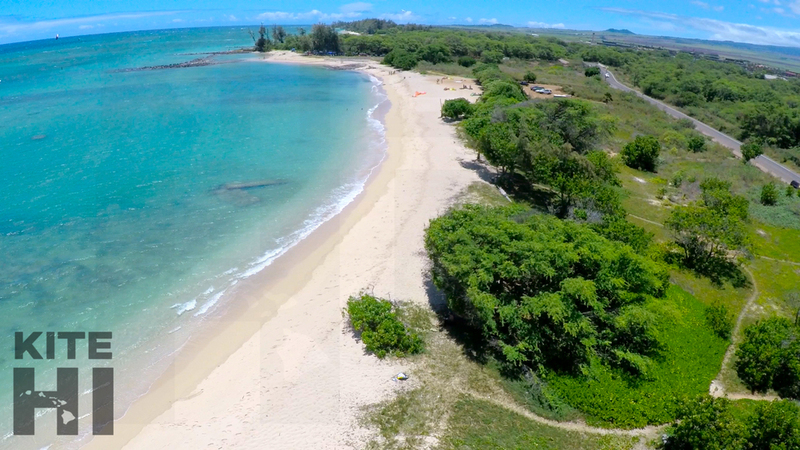 Located at the western end of Kanaha Beach Park where you will find a big dirt parking lot and multiple kite schools operating from. Typically we will get our prevailing trade winds from the NE to E direction which are the ideal direction for learning because it is a cross-onshore to cross-shore wind. If you are new to the beach, we strongly recommend you talk with some locals before you launch because their can be a strong wind shadow if the wind is directly from the E or SE which makes it difficult to fly your kite off the beach. Also beware of fisherman using the beach, beach goers not familiar with kites, and spear fisherman in the water. They always have right away and giving them space is mandatory to ride here. This is a great location for beginners to experts because it has a nice landing zone downwind should beginners fail to stay up wind and also the flat water pro pool upwind to throw down some freestyle tricks. In the winter months, big waves will be on the outside reefs and make for double black diamond conditions within less then a minute or two. The further out you go the bigger the waves and the higher the risks. Use extreme caution and if your not comfortable in waves, be sure to hire a guide from Kite HI to show you the safest places to have fun and proper etiquette for wave riding before venturing out to the expert riding zones (Boneyard, Lowers, Outer Reef Breaks). The upwind section of Kite Beach is a family beach. 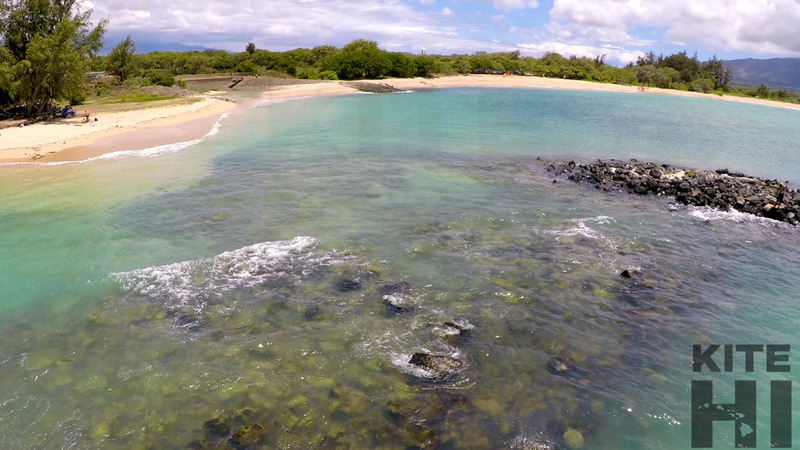 Native Hawaiians are usually here enjoying the family beach with their children and fishing. This is a territorial pool and you must never kite here when a fisherman has a line in the water or if there are children playing in this zone. This beach has a very turbulent wind shadow and it is for expert riders only due to the updraft from the trees and difficulty landing back on the beach with the extreme wind shadow on most days. Also there is a rotation for doing tricks in this zone and basically you need to be able to go into the pool close to the rocks and exit further downwind quickly should you attempt to ride here beware of the pros throwing big air tricks and be sure to give tons of room downwind for them to land on windy days. Named after one of the godfathers of kiteboarding, Flash Austin, this beach is one of the best places to go once you are upwind. The launch is much easier because it is more open then Kite Beach and there is much more beach to work with so it doesn't get as crowded and there is always a open place to setup. 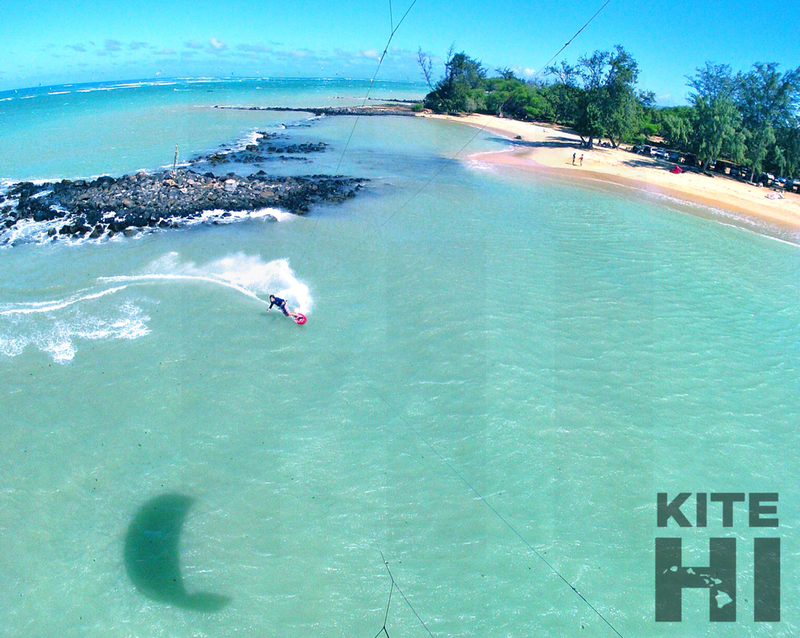 The wind is much cleaner and predictable near the beach and this is why you will find the majority of kiters riding here. Beware of Rock Jetties downwind as they are the biggest hazard on Flash beach, also the downwind outer reef on low tide (The Boneyard) has done its fair share of damage as well. Be sure to check with locals before going out to make sure you are not riding in swim zones which are off limits. If you decide to go upwind from here there is a good chance you will enter the Windsurfing zone which can get a bit uncomfortable if your not used to riding around them. They have right away 99% of the time so please use caution and keep a safe distance away from them. This beach is right next to the lifeguard tower which is also nice should you need help they will see you and be able to assist in emergency situations. 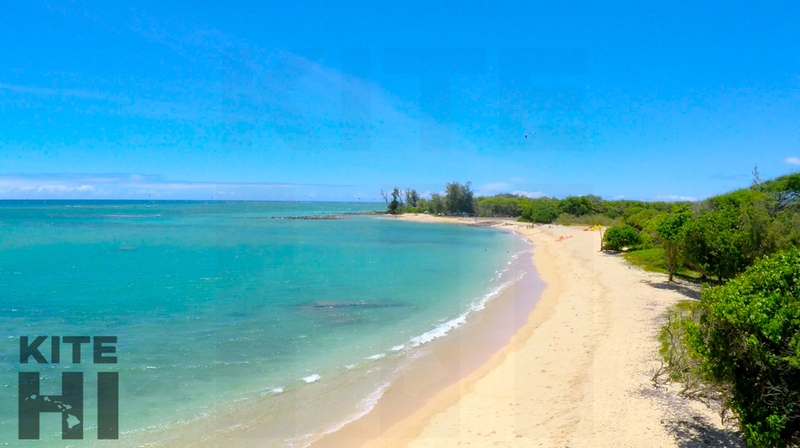 There are several access points to this beach and we recommend the Kanaha parking lot (old man's) because there are showers waiting for you after you ride and it is more secure. Be sure to lock your car and take your keys to the beach with you if you choose to park on the main road (amala pl) because there have been stolen cars and theft near the airport which could really ruin your trip. 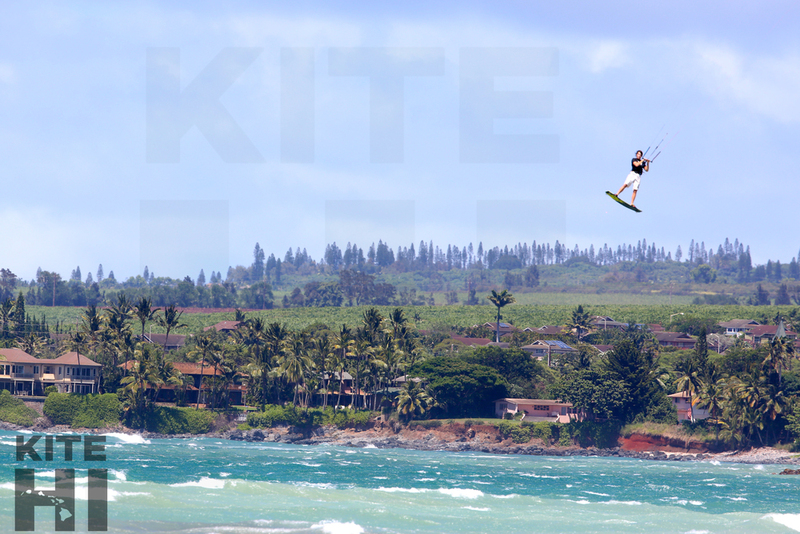 Maui's premiere big wave location and the Kite HI Pros' favorite place to kitesurf when the waves get big. For Experts only because you cannot make any mistakes due to the of the rocky coastline, sharp reef, gusty wind, strong currents, and big waves. Consider your ability before attempting to launch at Lanes, be prepared for extreme conditions and we recommend watching other kiter launch and land and ask all the questions you can before attempting to launch here for the first time. 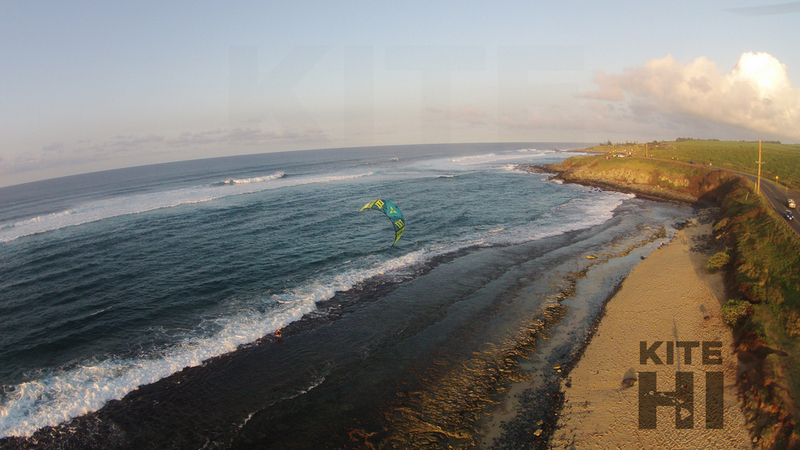 Also we think you should explore the downwind coastline to see all options for possible accidental downwinders. Booties are required for 99% of the local riders because of sea urchins and the sharp reef shelf you must walk across to access the ocean. Please observe the wave rotation and give everyone as much space as possible to make sure everyone is safe and doesn't get mad because you are in the way while they are catching waves and riding them downwind. 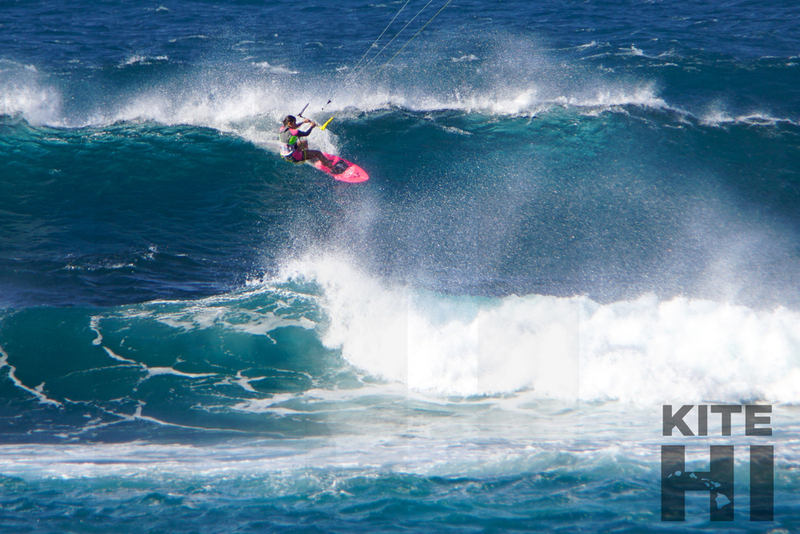 If 10 Surfers/Windsurfers are at Ho'okipa kiters must not be in the area. 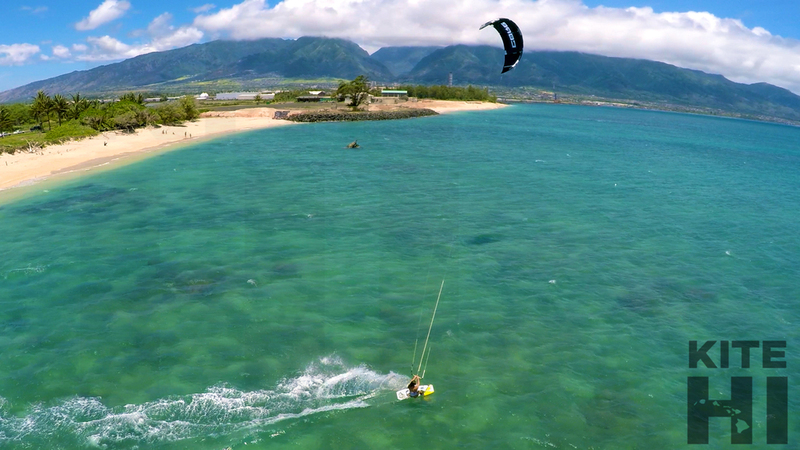 Windsurfers and kiters have equal priority when catching waves. Parking at Baby Beach is the best place to park and relatively safe with just a short walk to the launch site. The BEACH IS NOT SAFE against theft. There has been many thefts of kite bags and other gear off the beach. It is highly recommended to bring only a pump, kite and board with you to launch. Pumps left on the beach do not seem to be a theft problem. When launching please be extremely cautious to those on the beach and make sure you are not interfering with their activities. There is a designated launch zone and it is about a 10 minute walk upwind from the parking area, upwind of the reef. There is to be no launching any closer to the reef and beach goers near Baby Beach. 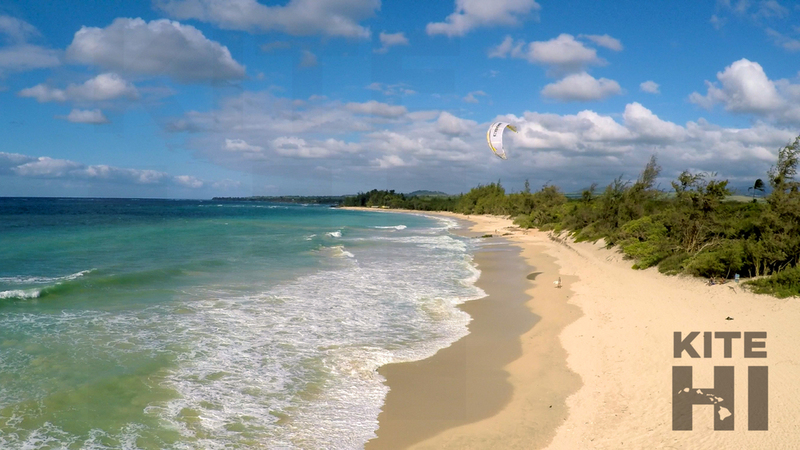 All Kiters using this beach are required to be able to launch and land themselves independently and safely without incident. 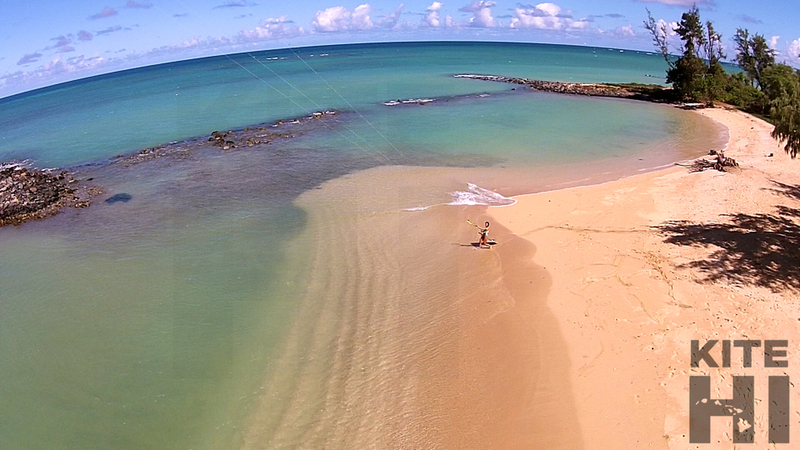 The beach is exclusively for launching and landing, no standing on the beach with kites in the air. No sailing within 1000' off the main Baldwin Beach because it is a designated swimzone, this means no riding in the shore break. Beware of the intense shorebreak when entering the water and plan for the current to take you towards the reef so have a safety buffer to get out. This is the most delegate zone because it is relatively new and we must have zero incidents. Be on your best behavior and respect all beach users and lifeguards otherwise we could loose access.